Schwinn offers quite several upright bikes, but the 170 model in their list is clearly the most inclusive. This particular exercise bike provides a wide array of workout possibilities, the most polished design, and a high-end progress tracking console. 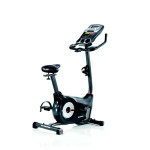 There are many similarities between the Schwinn 170 and Schwinn 130 models. This bike is actually an improved and polished 130, with quite a few extra features. Even though this model has been around for about two years, there aren’t actually too many other upright bike models to beat its quality. The Schwinn 170 features and eddy brake system. In other words, the braking and resistance levels are done via an electromagnetic brake, which requires the bike to be connected to a power supply. This bike offers 25 resistance levels, from very low, suitable for physiotherapy training, and up to very high, similar to the resistance in spinning bikes. Since it’s a belt-driven bike, it provides a very smooth and quiet workout. Plus, its drive system is basically maintenance free. You don’t have to grease it periodically, like in chain-driven bikes. The flywheel, even though not very heavy, it’s perimeter weighted, for high speed and high inertia, and to diminish the “stair effect” while pedaling. In conjunction with the electromagnetic brake, it results in a steadily resistant drive. The bike has a very solid, steel crank which can support even heavier users in complete standing up position. The crank arms have a different design from the ones featured by the Schwinn 130. The shaft extending to the pedal is slightly curved, generating enough space to prevent feet from touching the crank or bike frame when pedaling. The bike also comes with heavy-duty, oversized pedals, with toe straps, for secure and firm pedaling. Not only the frame of this upright exercise bike is extremely solid and steady, and can support even heavier users than the 300 lbs. (136 kg) maximum weight listed. It also has a very symmetrical and professional design. It simply looks great, and this can serve as a great motivation factor. The frame is steel-made, coated with anti-corrosive paint, for a long-lasting finish. The only plastic components of the frame are the drive / brake system shrouds. The box includes a 120V 60Hz AC input, 1.5A output AC power adapter, which is designed to fit any standard electrical outlet. The bike’s frame is finished with two sturdy bases, featuring leveling feet. The front base of the bike is also fashioned with transport wheels. Overall the bike isn’t extremely heavy, and easy to relocate. However, if you have to carry it up a flight of stairs, this may require two people. 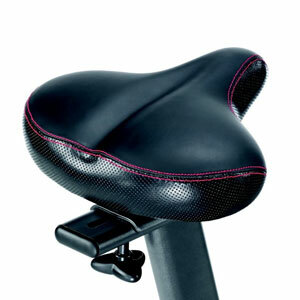 The Schwinn 170 offers an ergonomic, consistently cushioned seat. Even though it’s not an oversized seat type, it’s designed to support even heavier users, without causing discomfort. One of the big pluses of this stationary bike is the horizontal adjustability of the seat. This feature is really helpful to users with longer legs, who just might come too close to the handlebar when pedaling, during different workouts. Many upright bike models do not have this feature. Needless to say, the seat is also vertically adjustable. It can accommodate users between 4’8″ (142 cm) and 6’5″ (195.5 cm). Of course, taller users than 6’5″ can use the bike as well. However, in this case they won’t benefit from a full leg stretch. Since it’s a professional level upright bike, with all the inclusions possible, the Schwinn 170 features a handlebar equipped with heart rate / pulse sensors. These sensors are telemetry enabled, which means they are also compatible with various chest strap transmitters. Therefore, if you already use a heart rate chest strap, you won’t have to keep your hands on the sensors at all time to track your heart rate. The sensors will take the information from your strap. The handlebar has quite an ergonomic design, being generously cushioned for a firm grip. It also features forearm rests, which help a lot with arm positioning and stability during various workout routines. The handlebar is also angle-adjustable. In other words you can tilt it forward, downward or upward, and secure it in the position you find most comfortable, or more appropriate for the exercising routine you desire. Again, not many upright bikes come with this feature, which is quite great to have, because it plays an important role in the overall comfort of the bike. The “brain” of this indoor exercise bike is really, a multifunctional console. For starters, it’s the device that also controls the resistance levels of the bike. It features 4 main keys (2 right, 2 left) for gradually adjusting resistance, and 10 keys for quick resistance adjustment. The console unit makes available an extensive array of programs. There are 29 available programs, including 9 heart rate programs (1 custom, 4 beginner, 4 advanced), 12 profile programs, 1 quick start, 1 recovery test, 2 fitness tests, and 4 custom programs. It tracks time spent working out, distance, speed, calories burned, and heart rate. It also has a goal function, which gives you the possibility to set up a certain limit for your training. The console will display the percentage of you have completed from your goal, and also notifies you when you have reached that particular limit. There’s also a user profile function. The unit can actually save 4 user profiles. This function is great, especially if other members of the family use the bike, or if you want to use different training routines, with different program settings and goals. 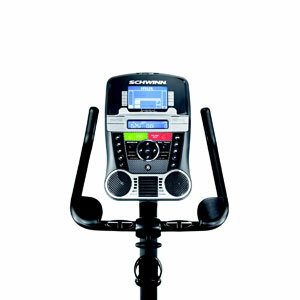 A great aspect regarding the console of the Schwhinn 170 bike is the USB port, which allows you to import your workout data, and upload it into sites such as SchwinnConnect or MyFitnessPal. These sites give you the opportunity to analyze your progress on a superior level, thus helping a lot with your future results. Along with the progress tracking functions, the console includes two acoustic chambered speakers for high quality sound. These come with a regular jack, so you can connect them to your smartphone, MP3 player or tablet, in order to listen to your favorite music, without the inconvenience of earphones. The console also fashions a tablet holder that can affix your tablet over the console display, to watch your favorite online streams, or browse the web while exercising. The console unit is also equipped with a 3-speed fan. During high-intensity workouts, this function can be extremely useful. Finally, the handlebar post of this bike fashions a bottle holder, giving you the possibility to keep your hydration close, every time you are working out. The “guts” of the machine come ready-assembled, and sealed by the lateral shrouds of the frame. You only have to attach the seat and handlebar posts, the seat and handlebar themselves, the bases of the frame, pedals and the console unit. The assembly is pretty easy and straightforward. The box includes the tools for this task, and the user’s manual which will guide your through it step by step. It shouldn’t take more than 45 minutes, and doesn’t specifically require more than one user to complete. Maintenance does not require much. All you have to do is keep the bike clean of dust and dirt, and before every workout session, check if all the parts and screws are tightened and secured in their places. Also, make sure you don’t spill anything on the console, as it is not waterproof. 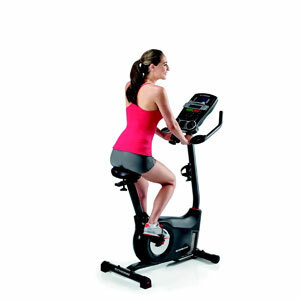 There are several factors that enhance the comfort of this upright bike by a lot. Seat and handlebars are both ergonomically designed, nicely cushioned, both adjustable, which gives you the possibility to obtain the exact workout position that’s most comfortable to you. Handlebar also includes forearm rests, which offer great support and stability for your upper body, reducing the incidence of any back pain or soreness by a lot. Due to the electromagnetic brake system, this bike is very easy on the joints, offering a smooth ride. It’s also very quiet. You can be sure you won’t disturb the other family members while working out, or the neighbors, if you live in an apartment building. 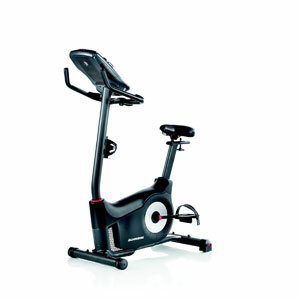 Other comfort enhancing factors that not many upright bikes offer are the speakers, the fan and the tablet tray. The speakers can always replace the inconvenience of your average earplugs, giving you the possibility to listen to your music, with superior sound quality. Fan keeps you cool during intense training. The tablet holder, which may seem such an insignificant detail, can bring a lot of comfort to this bike. Pedaling for an hour may become quite boring, and browsing the web while you’re at it, can surely improve your experience by a lot. The last comfort enhancing aspect to be mentioned is the bottle holder. This can be really useful if there isn’t any furniture piece near the bike, so that you can rest your drink. And placing your water bottle on the floor is still pretty inconvenient. There are two drawbacks to be mentioned in relation to the Schwinn 170 upright bike. The first one concerns the eddy brake. If you don’t have a power supply or there’s a power outage, you won’t benefit from any resistance levels. The second inconvenience refers to the size of the console unit, which might block the view to your TV, if the TV is installed at a lower level. But in this case, you can simply change the angle of the bike slightly, in order to get a clear view. All in all, the Schwinn 170 is a gym-quality upright bike, that offers utmost comfort and a wide array of workout possibilities. It’s not a bike made just for keeping a good muscle tone and a healthy cardiovascular activity, it’s also a bike that offers high intensity training levels, resulting in a high calorie burn. With this bike you can take down up to 6-700 calories per session. On top of this, it offers quite a range of workout programs and settings, along with many other features that other bikes do not have, all for a very affordable price. It’s a sturdy, durable, quiet and very effective piece of exercising equipment, an investment worth every penny. How do you connect your smartphone to the console? There is only one USB port for power and a mono-jack for plugging in your earphones. Am I missing something? This is the Schwinn 170 (2013). It doesn’t have a Bluetooth function. You can’t sync it with your tablet or smartphone. But, you can copy your workout data on a flash drive, connect the flash drive to a laptop or other device, and export your workout data to your MyFitnessPal or SchwinnConnect account. The newer Schwinn 170 MY17 model, the one from 2017 does have a Bluetooth function, though, and it can connect directly to your smart device via Bluetooth, to transfer data.